Ontario is undertaking a comprehensive review of how the Ontario Municipal Board (OMB) operates and its role in the province's land-use planning system to help make it more efficient and more accessible to all Ontarians. The OMB plays a central role in Ontario's land-use planning process as an independent, public body through which people can appeal or defend land-use decisions that affect their property or community. The changes under consideration would improve everyday life for Ontarians by providing easier public access to information about the OMB and its processes through an expanded Citizen Liaison Office. The proposed changes would also better specify what can be appealed to the OMB, as well as the mechanisms through which the OMB hears these appeals. 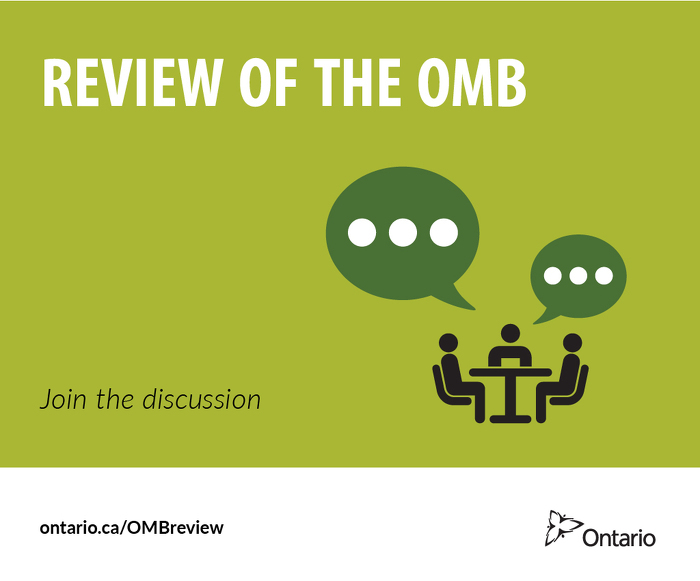 Ontarians wishing to participate in the consultation may submit comments online or in person at one of the town hall meetings being held across the province this fall. Improving the OMB's role in the land use planning system is part of the government's plan to build Ontario up and deliver on its number-one priority to grow the economy and create jobs. The four-part plan includes investing in talent and skills, including helping more people get and create the jobs of the future by expanding access to high-quality college and university education. The plan is making the largest investment in public infrastructure in Ontario's history and investing in a low-carbon economy driven by innovative, high-growth, export-oriented businesses. The plan is also helping working Ontarians achieve a more secure retirement. The OMB is an independent tribunal that makes decisions at arms’ length from the government. First established in 1906 as the Ontario Railway and Municipal Board, it is one of Ontario’s oldest tribunals. The OMB has a mandate under many statutes, but the majority of its hearings relate to Planning Act matters. Comments must be submitted by December 19, 2016. Read about the OMB’s role and history. This document was published on October 05, 2016 and is provided for archival and research purposes.